That Most People Only Dream About? You like feeling inspired, right? If you’re like me, you want to feel you are living your life on purpose and feel passionate about what you are doing. You’d like to make quantum leaps in your personal development and prosperity . . . not just once, but over and over again, on a daily basis. So I asked myself, “What is the most valuable thing I could give away? Inspiration that continues day after day. It’s an email subscription service ($99 per year value). I’m offering you a free subscription that delivers tips, techniques, articles, resources and stories of inspiration. Not just once, but an ongoing stream of tools, triggers, insights and catalysts to help you stay inspired and live your best life on purpose. When you join the free “Inspired on Purpose” newsletter, you’ll discover secrets like how to . . .
• Take back the reins of your life. • Get in sync with your life’s purpose. • Recognize and generate authentic inspiration. • Triumph from your troubles. • Keep your body, mind and spirit on the same team. • Allow more abundance into all areas of your life (including money). • Feel more excitement, enthusiasm and joy. You will be energized about purpose, passion and productivity . . . Meditation, manifestation and music for personal development . . . Inner guidance, awareness and “the secret” law of attraction . . .
Strong relationships, communication, health and well-being . . . In the mainstream, there are precious few encouragements for those of us interested in personal development. • The news media is grounded in negativity and fear. A steady diet of that doesn’t support intentions of personal growth. • Television and radio are generally not interested in personal development. Programming is targeted toward humanity’s lowest common denominator. Bad news sells. It’s not very inspiring. • The average people you meet aren’t much help. They have been so overwhelmed with the mainstream negativity, ideas of personal development rarely occur to them. But a growing number of us refuse to settle for mediocrity. Calling us average would be an insult. We demand more of ourselves. We choose to surround ourselves with empowering ideas and inspiring people. I have no idea how you found this website, but the fact that you are here indicates all these things are important to you. You already know passion infuses your life with a certain magnetism that attracts all the good things in life . . . solid, satisfying relationships, glowing health, vitality, a positive self-image, peace and abundance in all areas of your life. This is likely a good description of where your life is going and the kind of people you’d like to go with. Me too. Personal development is not easy, but you are not alone. As more and more people continue to wake up to the importance of their own personal evolution, better ideas, uplifting music, and clever tools emerge to support and encourage this fundamental urge. Next I asked myself, “What can I give away that will provide you with an immediate lift and really make a difference in the quality of your life?” Not tomorrow. Today! That’s how I came up with the “Inspired on Purpose Multi-Media Package.” It contains ten FREE bonuses . . . a thank-you gift just for allowing me to send your free subscription to the “Inspired on Purpose” newsletter. Here’s what you’ll get immediately . . . Your ten free gifts have a combined value of $342.73. We would like for you to have all of these videos, music albums, story and special report as a FREE, as a thank-you gift for signing up for your free subscription to the “Inspired on Purpose” newsletter. ($99 per year value). What most of us really want is freedom – freedom to do our own thing, in our own way, in our own time. These days, in order to experience this satisfying level of freedom, it takes money. It’s neither good nor bad – it’s just the way our society has evolved. My newsletter, “Inspired on Purpose,” is dedicated to this complete package of inner growth, personal development and inspiration. This includes tips, tools and techniques on how to discover how to live your very best life . . . in ALL areas of your life. This includes the science of manifestation and the art of allowing more abundance. Your privacy is very important to me. I will not sell, rent, trade or release your contact info to anyone for any reason. Spam is the scourge of cyberspace. I would never, ever contribute to it in any way. Your name and email is strictly confidential. Just enter your first name and primary email account. 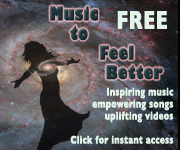 Then click the button that says “Instant Access.” You will be taken to a page where you can immediately watch the first video, “Feel Better First” and download the first music album, “Music to Feel Better Song Sampler.” You will be enjoying them just a few moments after you enter your name and email address. Do it now. P.S. Since this is a test and limited to the first 100 people who sign up for the free subscription, this page and this offer may be gone if you try to come back later. Right now, you can get $342.73 worth of free bonuses simply by entering your first name and primary email address in the boxes above. Don’t miss out on this limited-time offer to get your free subscription to “Inspired on Purpose” newsletter. You’ll get over three hundred dollars worth of inspiration and uplifting music absolutely FREE with no strings attached.